Reverend Karen MacDuff helps us rediscover the spiritual path of Christmas. Behind the stressful, over-commercialised holiday season is an ancient tradition of reflection and rebirth. Karen shares four beautiful, non-denominational spiritual practices that are a perfect way to close off the year. Benay: [00:00:00] Welcome to another episode of Coach Pep Talk, the podcast for people who run their own coaching businesses. Each week I talk to an expert who shares wisdom that helps us be better coaches and better coaching business owners. This week I have a very special seasonal guest on the line, Reverend Karen McDuff is going to be talking to us all about spiritual practices that you can do during the 12 Days of Christmas. And this is relevant no matter what denomination or non-denomination you are. So I’ll see you on the other side. Benay: [00:00:35] Coach Pep Talk is proudly brought to you by Life Coach Office the one stop shop software for managing your coaching business totally online. Life Coach Office is perfectly suited for the single coach boutique coaching business, where you actually are coaching clients one-on-one as well as offering online classes and courses. You can jump in and try Life Coach Office and that’s really the best way to know if it’s going to be a good fit for you and your business. You can do that for free for seven days by going to LifeCoachOffice.com And signing up for that free seven-day trial. All you need is an email address to sign up. Check it out at LifeCoachOffice.com. Benay: [00:01:14] Welcome back. 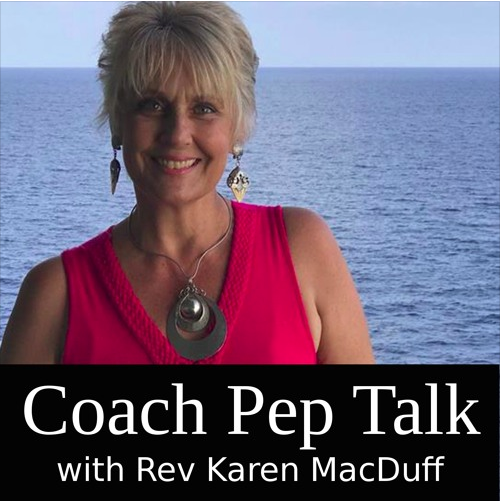 As far as I know Reverend Karen McDuff is the first Reverend I’ve had the privilege to interview on Coach Pep Talk so far. So I’m deeply honored to introduce you to today’s guest, Reverend Karen McDuff who is currently serving as a United Methodist senior pastor in Florida, United States. She’s also a spiritual mentor in her own business the Mystic Way Seer. Benay: [00:01:39] Now you might be scratching your head thinking, “OK how does that work together?” So really when you boil it down Karen helps people create a spiritual path and a series of practices that work uniquely for them. It’s free of judgment and religious dogma. So she really meets people where they are and helps them embrace their own spirituality. So without any further ado let’s hear what Karen has to say about the spiritual practices that we can all take on board during this wonderful period of The Twelve Days of Christmas. Benay: [00:02:12] Hello Karen and welcome to the show. Rev. Karen MacDuff: [00:02:16] Hi Benay. Thank You. Benay: [00:02:17] I’m super excited to have you on the show today and to do my very first sort of holiday themed episode. I’ve never been in a position to do this before. But our paths have just crossed serendipitously and I knew that you were the woman to do the Christmas show for this year because this is my finishing my first year in my podcast. So I’m really excited to have you on the show to help us sort of look at Christmas in a new and different way and talk about these spiritual practices that people can do in the 12 Days of Christmas. Rev. Karen MacDuff: [00:02:50] Thank you Benay. I I’m actually honored; I didn’t realize that I was your first seasonal holiday guest. So thank you. Benay: [00:03:00] Yeah. I’m really excited. So when we were, you know, just every time I hear you speak I’m just like oh my gosh this woman has so much power and so much magic. And then I love to that you are part of you know, an institution in the in the church and yet you’re bringing this new and fresh messaging into the world. So that’s why I was you know, really enthusiastic to get you in. Because even though you practice in a church you’re bringing a kind of almost non-denominational message that will resonate with anybody who has a spiritual side. Let’s kick off with, can you just tell us a little bit about the 12 Days of Christmas because everybody might not you know, be on the same page there? Can you just sort of tell us a story, paint us a picture about, what are the 12 Days of Christmas? Rev. Karen MacDuff: [00:03:48] Yeah you know, it’s I’m glad you asked that question, Benay, because as you know, the world and culture begins celebrating Christmas what, the day after Thanksgiving or even today on Thanksgiving. And something I love to share with my congregations and those that I mentor is that the season that actually comes before Christmas is called advent and it’s a four-week season that leads up to Christmas and there is particular scripture readings and prayers and it helps us to get ourselves ready and prepare in a spiritual way for Christmas and really kind of gives us some natural boundaries Against some of the ways that the culture celebrates Christmas. And I was talking to my congregation the other day and some of the women said to me, “Well Merry Christmas. Merry Christmas.” And I said wait a minute it’s still advent, Christmas doesn’t start until the 25th and as a matter of fact it lasts for 12 days. And they said, “What do you mean 12 days, is it is it like the song?” And I said well sort of. But the church season of Christmas begins the 25th which I love because then there’s no more focus or having to you know, buy gifts and you know, cook meals and send out cards. And it is a perfect time to focus on one’s spiritual relationship with God. Kind of in between the new two year’s time to reflect and I love that the Twelve Days of Christmas ends with January 6. Do you know what January 6 is, Benay? Benay: [00:05:52] I have an inkling from our previous conversations but please do share with us. Rev. Karen MacDuff: [00:05:57] Okay. January 6 is called Epiphany Sunday, the day of epiphany. And this year it happens to be on a Saturday. But that is the day that the church celebrates the Wise Men visiting the Christ child. And what I what I find interesting is that most people when they set up their manger scenes in their homes they put the wise men right up there with the shepherds and everybody else but really we know that the Wise Men did not arrive until about two years later and it was at the home of Mary and Joseph and Jesus when he was about two years old. And the other thing I love about the wise men is that when they came to visit the Christ child who they believed was a king, they were foreigners. They were actually stargazers, astrologers, philosophers from foreign countries and they had heard, so the stories told, of this king that was born and so we know that they followed a star thus they’re astrologers and the Epiphany is that their lives were changed, they were somehow changed. And I love the texts, the scripture text, says that when they went to go back home they left and they travelled a different way and it that’s that is what happens with an epiphany, like we have a light bulb moment. The spirit touches us and we never seem to go back home the same way. So this is the 12 days of Christmas that I loved to bring in some spirituality. Benay: [00:07:57] yeah, And well all of that. So it’s like you know, we have seasons through the year and then there’s this very structured seasonal process for setting the stage for reflection and an epiphany. I mean how cool is that to build that in every year. I mean on a personal spiritual level but also on a business level because you know, a lot of our listeners are even business owners themselves so it’s like it’s multi level them preordained process that we have a permission to use here. Rev. Karen MacDuff: [00:08:33] Exactly. And it’s today we do it, but we’re using different language. We’re saying, oh you know, I had a shift in consciousness, Or the evolution of consciousness, or you know, we’re using different words but it’s an epiphany. you know, spirit just kind of opens our mind up and our hearts up to something new and we’re changed in that instant. And I love the fact that the wise men, we like to call them wise people because we like to be inclusive. The wise ones they were foreigners. And so this is good news and the light that came into the world is really for everybody, for all of us. Benay: [00:09:23] OK. So the Wiseman had an epiphany and they travelled home a different way. Once they saw the light. So we’ve got this beautiful process, this beautiful procedure that’s built into the seasons. Before we get into the nitty gritty details of you know, some spiritual practices that we can do in these, in the specific window of 12 days of Christmas between the 25th of December and the 6th of January. Can you, I’d like to just talk a little bit about you know, Christmas has kind of become a strange beast in modern society like very consumeristic and you know, very stressful and, not at all necessarily, but Well for most people you know, this beautiful time of reflection and connection. I mean it’s there but it’s like buried underneath all this other kind of yucky stuff. Can you talk about a little bit about your situation with when you started to look at Christmas with new eyes and how these spiritual practices were born for you? So that you know, other people might be inspired and encouraged to look at Christmas with new eyes too, if they need this break from the stress and commercialism of it all. Rev. Karen MacDuff: [00:10:37] Yeah I just love the way you put that Benay. You know, it’s interesting, the more people that I talk to and share my story with they seem so hungry and thirsty for a different way to celebrate the holiday. It doesn’t mean that you know, we give up all of our traditions it just means to, like you said, begin to, well see with new eyes that’s what an epiphany is. But I remember well probably 15 or 16 years ago, it was about a couple of weeks before Christmas and my husband, I was married at the time, my husband just overnight lost his job. And you know, he had a very good income and salary. And so overnight there was just not enough money. We had two teenage daughters at the time. And I was secretly relieved that I didn’t have to buy all these gifts this year for all these people some of them, you know, we just buy because we have to. And so we kind of, I wouldn’t wish this on anybody, but we didn’t have the finances to participate and we were so creative. We lived in the woods in southern New Jersey and we made things, we foraged, we collected pine cones and we scented them and we gave them as gifts and we the girls my girls had part time jobs and they actually took some of their money that they earned and purchased little things. They made Christmas breakfast. I mean it the children came alive instead of being you know, children, “This is what I want for Christmas” and “I want this” and “I want that.” They had an epiphany and they suddenly switched. And at the same time I had my first appointment at a little country parish in New Jersey in a little Methodist church. And so I began to focus on spiritual aspects and like I said that’s with Advent you know, we light purple candles, four Purple candles on a wreath and then we have the White one in the middle that’s the Christ candle and that one gets lit on Christmas and is like this anticipation and this waiting. And so those two pieces I just, I’ve fallen in love with advent. I really have. And people that know me whether it’s in New Jersey, or Maine, now in Florida when they hear advent and they say oh yeah Pastor Karen MacDuff. I just love it. Benay: [00:13:50] We are gonna talk about that in the practices. Yeah. Before we leave that, thank you so much Karen for sharing that story with us. I’m curious now I mean because I’m a mother too, I’ve got a seven-year-old daughter, she of course loves Christmas and presents and everything. I’d love to know you said you’re your kids switch from I want I want to a different state. Can you just a little bit about what that state was? Rev. Karen MacDuff: [00:14:13] Well it was a mindset of giving. There was no way because of the situation, they realized, their parents, there wasn’t the money to purchase Christmas gifts. And I had a craft business at the time too in a retail store and I said well what can we do? What can we make? And they were really excited about that. I don’t know if my husband didn’t lose his job if they would have had that shift. Benay: [00:14:51] I’m not what I’m hearing too as you as a mother really guided that by setting the stage to let it happen. Rev. Karen MacDuff: [00:14:59] Yes. Benay: [00:15:00] Those two things really worked beautifully together. Thank you. Just as the mom and the other moms listening, I just wanted to get a little bit of clarification here because I’m picking work picking up tips on how we can you know, pass the true spiritual meaning and I guess awakening process to our kids so just wanted to clarify. Rev. Karen MacDuff: [00:15:21] Yeah and my girls I know a lot a lot of mothers do this today. If we have time, we always we did things together. We always made things together and even to this day my daughters will bake all kinds of cookies and My one daughter has chickens and bees and she’ll give honey and make things and package it up nicely and I know it’s from that time from what they learned and they are gifts from the heart. Benay: [00:15:54] Yeah you know, we might have to add that into the 4 spiritual practices, giving those gifts from the heart. Because I remember too, well growing up when my mom loves to make fudge for example, and she would just make piles and piles of fudge and it was always everybody’s really excited when it was Christmas time because mom’s fudge. My sisters were a little bit better at making fudge than me. I’m not that kind of baker, but ok so let’s get into it then. So you know, for people that are really excited about the 12 Days of Christmas and doing something to reconnect with their spiritual side and you know, and to step into a more calm and peaceful space during this this window in the year. What are these four spiritual practices that you’d like to invite people to try on this year? Rev. Karen MacDuff: [00:16:45] Okay. Well there’s the four of them that I have, I talk about candles, I talk about silence, decluttering as a spiritual practice and also review and reflect. What I like to do when December 25th comes and it’s over. Like I said it’s my favorite time of the year, it’s a time where we naturally want to look back, we want to look ahead and a lot of people were planning goals. I have a different, I look at it through a different lens. What I do for 12 days, and I would love people to join me in doing this, knowing that they’re celebrating 12 days of Christmas is to bring some candles into your time of Practice. Of intentional practice of reflecting. What I mean is… Let me let me, I’m just kind of go backwards here. What I what I was saying that I love to, I love to reflect. Okay, I love to. And what I do is I get out my calendars from the year, my day timer, my journals. I love to journal. And I get all those things out that show me what I did or where I went the past year. And when I do that I’m very intentional. And so I will light a candle. I have a white candle which to me symbolizes Christ the light of the world and when I light that candle it’s letting me know that I’m being very intentional in this practice. And when I go through my journals and I read I’m not looking with eyes of what did I accomplish and then what do I want to accomplish next year. But what I’m looking for I’ll ask the spirit to come shed some light on and I look at the people that touched my life. you know, and it’s something that I can so easily forget the people that touched my life that without them, I wouldn’t be where I am today. And it could be in a small way it could be in a you know, a bigger way. And then I’m reminded too of the people’s lives that I touch because that’s very important to me and I think it I know it is with you too. We want to make a difference in people’s lives. And to touch them in a specific way. And it’s I was thinking of you know, the classic movie It’s a Wonderful Life. Rev. Karen MacDuff: [00:20:03] Okay. Well It’s a Wonderful Life is a classic movie that’s been for years and years and years and I am going to bring your Christmas Eve message on it. But a gentleman is pretty depressed and he’s gonna jump off the bridge. And this angel appears and he kind of flashes his life before him of what his life would have been like if he did you know, jump off the bridge and take his life. And so many people wouldn’t be where they were today or he would never have had children. And so just a just a way to look at who has touched my life and who’s lives you know, have I touched. And another thing I like to do is, I’m very interested in personal and spiritual growth transformation. And I like to see where I have grown personally and where I’ve grown spiritually. If I’m not growing in those areas, I am not really happy. And so that makes me feel good as well. And then I’ll at what books have I read. did You have a question? Benay: [00:21:40] Yeah, Just on the on the reflecting on the personal, spiritual growth and transformation. Do you just look back through the year and reflect on where you’ve actually grown and developed? Is there more to it? Rev. Karen MacDuff: [00:21:53] Yes. For example, this interview is a big stretch for me. This is my first podcast interview and there was possible that I that I wasn’t going to do it. I mean this is a growth for me, and I’m delighted. Benay: [00:22:15] So we’re going to make your list. Yay! Rev. Karen MacDuff: [00:22:17] Yeah yeah. And even in little things you know, forgiving someone that offended me or that I felt offended me but just asking you know, God to help me forgive them. You know, where I have grown personally and spiritually. Benay: [00:22:37] Yeah. Now that’s great. Before we get on your books you read. I just wrote a couple of other questions, I take lots of notes when I’m interviewing people. When you light your candle and you said you know, you set your intention, do you say anything? Or do you do anything when you light the candle to set that space or do you just you know, strike a match light it and sit down or you know? Rev. Karen MacDuff: [00:23:00] I do I’ll say something silently or I’ll say out loud just acknowledging the presence of God that’s already here. And I always ask for light to be shed on whatever it is I’m about to do. I lit a candle before we got on the phone tonight. Benay: [00:23:21] I love that I love that. Rev. Karen MacDuff: [00:23:22] And it helps me to just surrender. you know, just to give up control in and just to trust that God is working through me. Benay: [00:23:32] Yeah well OK. I mean I know that God can be a contentious word for some people and some of you know, our listeners are across the board. Would you like to… What can they use if they had a problem using the word God? Rev. Karen MacDuff: [00:23:48] Yeah. you know, that you’ve got a good point it is a pretty loaded word. When I talk to talk to people all around the globe and I like to say creator, divine, source you know, infinite being, universe, there’s so many so many words, wonderful creative words that really mean the same thing. Benay: [00:24:12] So people can just find the phrase that works for you. Rev. Karen MacDuff: [00:24:14] Absolutely. Benay: [00:24:15] And bring it in and invite it into your reflection session. Rev. Karen MacDuff: [00:24:24] Absolutely, Absolutely. Benay: [00:24:26] Love it. The Other question that I had is I’m a really you know, how to- systems kind of person. So when you’re when you’re doing the reflecting you know, you’re asking you’re looking at who’s lives you’ve touched and who has touched your life this year. Are you writing things down in a journal or are you just sitting there and thinking about them? Rev. Karen MacDuff: [00:24:47] I’m a writer so I am always writing and of course I’m thinking as well but I’m always writing. I’m making little bullet points and jotting, there may be something I need to follow up on. But for me what’s most important, is to see that that I have that I’ve grown and that I am moving forward and touching people’s lives. Benay: [00:25:16] Yeah and the maybe just are you… Do you celebrate it or does it give you a certain kind of feeling in your body once you’ve connected with that journey? Rev. Karen MacDuff: [00:25:28] Yeah I feel joy. Yes, I feel joy. Which is a little bit different than happiness. I just feel that that deep abiding joy. Benay: [00:25:39] So this is kind of an opportunity to just do some treasure hunting and connect with your joy as opposed to you know, an assessment of where I went wrong, it’s a different kind of practice. Rev. Karen MacDuff: [00:25:51] Absolutely because we sure can look at where we went wrong quite often. In fact, I think too much. Benay: [00:26:01] I agree, I totally agree. Rev. Karen MacDuff: [00:26:01] Beat ourselves up and yeah, so it’s like you know, what went right? What was good yeah kind of shift those brain patterns a little bit. Benay: [00:26:14] So Just quickly I know that you mentioned that you also in this time you’re talking about books that you’ve read. Is there anything you’d like to say quickly about that before we move on to one of the other practices? Rev. Karen MacDuff: [00:26:24] No just that I’ll look and see, you know, what books because I’m always learning usually whether theology, spirituality, coaching or transformation books, you know all kinds of books. Benay: [00:26:41] I guess I kind of jog your memory of other things that have actually happened that you might not have realized otherwise. Yeah. Yeah. Okay cool. Anything else on this? If this was a combination of candles and review and reflect I’m interpreting. Rev. Karen MacDuff: [00:26:58] Absolutely. And then I think towards the end I, well I actually begin to develop a lot of gratitude. And like I said if there’s any amends that I will to make to anybody, if I feel that I’ve wronged anybody or somethings left undone or unsaid, I take care of that. And I think at the end of our conversation I do a mini version each evening as I reflect not only during the twelve days but throughout the whole year. I do kind of like in evening examine. So if we have time we can talk about that too. It’s really powerful. Benay: [00:27:44] Mmhmm. OK. So I just thought that that brings me up another you know, another system question because of course I’m looking for the process in what you’re doing. So do you do this, the Lighting your candle and reviewing your journals and what you’ve read and asking yourself these questions. Do you Do it each night of the 12 Days of Christmas? Or do you is it one session? Or is it a couple of days? Rev. Karen MacDuff: [00:28:06] Well it depends. It depends what is on my calendar and what is not on my calendar. What I’m doing this year and I do most years is I make sure that I have some retreat time and this is where the silence comes in. I am going in to a cabin in the woods with a spiritual director for a couple of days after Christmas and it’s going to be in silence. So I will take everything with me. I’ll go through this process and then maybe take a walk. I’m in Florida it’s nice and warm so I you know, may take a little boat ride or you know will sit and listen to the birds. But silence is so important. Benay: [00:28:55] It’s tricky to do these days. Yeah. Rev. Karen MacDuff: [00:28:57] It Is. It is. And that I’m so I’m so passionate about periods of silence. And today there’s other there’s even more things that we have a silence, you know, our cell phones and computers and all those interruptions and so I make an intention to unplug. Yeah. Benay: [00:29:25] Do you know, some people you know, probably have done 10 day silent retreats and you know, might be really comfortable with this place but for people where this is really new, what advice would you give to them if their like, oh my gosh silence sounds amazing. First of all, maybe you could plant the seed like what happens when there’s silence and then the next question would be, how do you start? Rev. Karen MacDuff: [00:29:52] Yeah well what if it’s something that somebody wants to try I would start in smaller increments you know, five minutes, ten minutes, something that I shared with some friends This year was to set your cell phone several times during the day, 9:00 a.m., 12:00, 3 afternoons, 6 p.m., your alarm to go off and when it does if you’re in a place where you’re able to be intentional and pay attention and be silent to just simply be silent. Just be silent. Just begin to observe and what is going to happen is that you’re gonna notice that you’re thinking all kinds of things and you can’t shut your mind off. And that’s very natural. It’s very natural. And you simply increase your time. But you know, a person has to want to. The rewards are you’re really meeting yourself. You’re meeting that spirit deep within. And when you’re able to be silent and have that inner solitude, it’s a wonderful place to be. It is a wonderful place to be. Benay: [00:31:16] I’ve started doing that this year. It’s sort of a meditation, a silence, it’s a bit of a mixture and man, it’s like now, it like Why can’t I just this just do this for the whole hour. I started in five minutes and now it’s like 20 minutes is hardly enough. It’s so nice you don’t want to leave. It’s amazing. Rev. Karen MacDuff: [00:31:37] Yeah well twenty minutes is the perfect time now that you mentioned it. In the Christian tradition, Father Keidan has come out with something, He calls it centering prayer and that’s something your listeners can Google. And it is a time of simply being silent, you’re not meditating. It’s not a guided meditation, you are simply having the intention. You’re lighting a candle. You’re coming before spirit, the divine source, and you are intending for you know, source divine you know, to work through you and as your thoughts come up, as you probably know if you’re doing it, you just watch them float by like little clouds. Oh yeah there goes another thought. Oh yeah there goes that again. And you know, you come back to center. He usually suggests that you choose a word, which would be a word that you would repeat to help you come back as center. But 20 minutes is like that magic time where that divine Spirit can just begin to work deeply. Rev. Karen MacDuff: [00:32:54] a Place of peace. Benay: [00:32:56] I’m loving all of us. It’s a really powerful thing. And the benefit that I have noticed from it is I do it right before I start work. And usually my workday kicks off with a podcast episode or with a coaching session. So it’s really nice to come into that in peace and often quite often I’ll think about that person before. And yeah. And it’s just it’s like everything’s calmly where exactly where and what it needs to be in this moment. So yeah it’s as far as doing a sales pitch, that’s my sales pitch. Rev. Karen MacDuff: [00:33:29] Exactly. Exactly. And for someone to say well I don’t have time. You actually gain time, don’t you? Rev. Karen MacDuff: [00:33:38] You’re more centered, you’re more focused. Benay: [00:33:39] It’s amazing. It’s like you can stretch out your day actually by doing this. So I’m looking forward to the new year to incorporating more of it into my day so that I have more time for myself, it’s amazing. Rev. Karen MacDuff: [00:33:51] It’s like multiplying the loaves and fishes right. Benay: [00:33:55] It’s magic. OK so Karen so I just want to I want to recenter with you know, with everybody. So we’re talking about the spiritual practices that you can do over the 12 Days of Christmas which is the period between the 25th of December and the 6th of January and the first practice that we discussed was this process of lighting candles and setting your intention and then reflecting on the year. And you’ve given us all sorts of beautiful questions and areas to explore and to journal. Now the timing of that it sounds like it’s up to the individual. They can make a day of it. They can do a nightly routine. It’s really whatever goes but just fit it into that Twelve Days of Christmas and maybe it will carry you, you might continue doing into then into the year. Is that is that kind of the right interpretation, have I missed anything there anything you’d like to add? Rev. Karen MacDuff: [00:34:51] No I what I like to do is when I do work with people in mentoring. Like you’re saying well what are we going to do how do we do it. Everybody’s different and unique and so somebody might want to have a little bit of time in the morning you know, busy parents. you know, it’s hard to carve out time. Somebody else may want to have chunks. So it’s unique and individual for each person. But it’s the intention and it is a way to appreciate what has passed. Be grateful and to carry that appreciation, joy, gratitude into the new year. And trust me, something will stick. Something we’ll stick, even if you just simply light a candle and that’s something new. That’s going to make a shift. Because you can say a prayer, you can say your affirmations, you can express what you’re grateful for. And the silence. I mean having periods of silence. How many of us do not have that? Benay: [00:36:09] Mm mm. Probably most. Well actually I did have poll in my private Facebook group and quite a lot of the coaches who were in that group actually start their day with a meditation. I was really impressed. So maybe we’re talking to our advanced audience here. Rev. Karen MacDuff: [00:36:27] Preaching to the choir as we say. Benay: [00:36:28] yeah we can always step it up a notch. So there’s always that next level for me. you know, I’ve started my morning silence before my work and now I want it to increase the time and also do it and more each day because I just give benefits OK. So silence, so in the Twelve Days of Christmas you know, do this reflection period, light candles, find moments of silence, whatever you find that can work in your life and in these days for you is perfect. Is that the message? Rev. Karen MacDuff: [00:36:58] Absolutely. Benay: [00:36:59] Just do it. Okay excellent. Well let’s move on to the next one then which is why I think is declutter. What do you want to tell us about that? Rev. Karen MacDuff: [00:37:10] Well decluttering as a spiritual practice. How about that one? Rev. Karen MacDuff: [00:37:17] Yeah, it is a spiritual practice. I I’m so passionate about that because sometimes you know, clients or people want help with something and they might now want to, oh um how can I say, right, let me just backtrack. Decluttering is pretty big today. And something that I noticed when I had my first experience with that, I was living up in Maine, the north part of the United States and I had sold two houses worth of stuff, my lifelong belongings, two houses full and alls I had left was what was in my Jeep and I drove, moved to Florida. And the freedom that I felt and the lightness and that was an epiphany for me. Because our stuff weighs us down more than we know it. Even if it’s clutter in the car, your offices. As a coach you probably know the importance of having an office that is inspiring. But the people that I’ve worked with cluttering, they feel a lightness they feel a freedom. They move things out of their space and then they begin to grow in other ways. Personally, spiritually there’s energy for you know, new projects. It’s fascinating. It is absolutely fascinating. Benay: [00:39:23] So let me just check in here. Are you saying that if you know, I clean out my files and get rid of all that crap that sitting behind my chair here then it’s going to make room for new and even better things next year? Rev. Karen MacDuff: [00:39:35] Absolutely. Benay: [00:39:37] I love it, how easy is that? Rev. Karen MacDuff: [00:39:39] It is! Is so easy and it’s for most people it’s not threatening, it’s like Oh yeah I’m going to throw some things away. But it, they drain our energy. It drains our energy. If you have files and piles of paper, I mean every time you look at that pile, what do you say to yourself? Benay: [00:40:00] Got to clean this up. Rev. Karen MacDuff: [00:40:05] Exactly. And that it’s just a little drain. And so we’ve got our energy being drained in various ways. And when it’s decluttered and there’s a system put in place, your mind is freed up, your energy is healthier. you know, you have more healthy energy. Benay: [00:40:29] We’re at full capacity to do other things. Rev. Karen MacDuff: [00:40:33] Yes. Benay: [00:40:34] It’s all noisy distraction and great procrastination strategy. I mean to have like a completely messy desk and everything in disarray it’s a great way to procrastinate from your greatness and being your best self. Rev. Karen MacDuff: [00:40:47] Exactly. Exactly. I have a story I can share here. One of my clients, I do declutter group once a month on Saturday and we gather together as a virtual community and I use coaching and we have a Facebook group that we do live calls and we each have projects and we just go to them at our own homes and then we would check in online and whatnot. And one of my clients said to me the other day she says, you know, I just love my bedroom, I got rid of all those papers. She says, the only thing I have left or in the bed are these three little bags of silver spoons and she said they’re antique. They’re from my family and I know one of one set of these spoons are from the seventeen hundred and I just I just can’t get rid of them and I said well what’s the attachment. And she said well somebody saved them all those years for so long, I said but look at look at the tension that it’s creating in your mind every time you walk in that bedroom and you see those spoons sitting there on your bed. What am I going to do with them you know, that the self-talk that goes in it you know, on hand in her mind. And at that point she said You’re right I’m getting rid of them. And they’re gone. And so, little things like that it helps us to free up from those attachments. Benay: [00:42:24] Yeah. Well and if you think about like all of those little tiny things that you’re, your sort of just allowing to be present every day, even though it’s just you know, a set of spoons but you know, maybe you have 100 sets of spoons in your house. There are different things of course but each of these things is just draining that little bit of energy. So each little move like that is massive When you when you compound it all together. Rev. Karen MacDuff: [00:42:49] Absolutely. Absolutely and one of my coaching programs they we call them tolerations. you know, I mean, each person we each have hundreds and hundreds of these little tolerations that drain our energy On any given day. And so it is a spiritual practice to begin to address these things and decluttering is something that’s a lot of fun especially when it’s done with a group. Benay: [00:43:14] Yeah. So are there other tolerations besides physical things that you need to be looking at as their as their spiritual practice or is it…? Benay: [00:44:28] There’s that little bit of a drain or that lot of a drain depending on. Okay well, Karen, I was not aware of this group, is this something that people can actually get involved in if listeners are kind of lighting up and getting excited? Is that something I can link to in the show notes? Or is that a private group? Benay: [00:45:02] We’ll get that right at the very end because we still have one more thing to cover in our practices. Okay but that’s great. So if they want to learn more about these declaring sessions they can actually get to you on your Facebook page, and we’ll give you the links in the show notes and then Karen will let us know at the end too listeners, if you’re chomping at the bit to get in. Rev. Karen MacDuff: [00:45:21] Yes and I had one that I have one that’s going to be on Epiphany which is January 6 so I’ll have information. Benay: [00:45:29] Okay cool. Okay so let’s see, we have covered candles, we’ve covered silence, we’ve covered declutter. And reflection, I think we have done them all. Is there anything else? I kind of want to add this spiritual practice and maybe it’s actually something that you do during Advent instead of the 12 Days of Christmas, But I love how you brought in you know, when your husband lost his job and you guys, your family just got really creative about creating and making things out of, out of love and connecting together with each other to produce gifts. I loved that. Rev. Karen MacDuff: [00:46:08] well not really. And maybe next year would be a good time for people to think about their they should start thinking about it now. Benay: [00:46:16] They could Start a Pinterest board On cool Christmas making ideas and then just like Just make your presents. Rev. Karen MacDuff: [00:46:25] Yeah. Benay: [00:46:26] OK. Is there anything else you’d like to say? Just on the spiritual, those four spiritual practices before we start wrapping up? Rev. Karen MacDuff: [00:46:37] On well just like I said earlier, any one practice will begin to help someone make a shift. And if you’re intentional for those 12 days you will be blessed. Absolutely. Benay: [00:47:02] So if you know, I love that, that you can just you can just take one. Would you suggest that they take one and do it once in the twelve days or they take one and do it every day? I know we kind of touched on this already, but still got question marks in my head, so I’m just gonna go with that. Rev. Karen MacDuff: [00:47:18] Well, like yourself I’m a trained coach, and I say it’s always up to the individual. If you know, how I do it, I do something differently. I would just leave it up to the individual. Benay: [00:47:38] Whatever resonates with you. Rev. Karen MacDuff: [00:47:40] one thing though I know what I do for another church season, lent, you know, the 40 days of Lent is to each day, and you could do this for the 12 Days of Christmas too, but each day, be intentional about removing either a bag or a box of stuff from your house. Either Throwing it away or recycling it or giving it away. you know, every day you know, a package or something is going to go out the door and you could you know, target a room, clothes closets you know, different projects and things like that. And I think it’s the perfect time because we’re going to be put our Christmas stuff away soon. And it’s a good time while we’re putting you know, putting things away to start to move some other things out. Benay: [00:48:33] Yeah I’m totally into it, I’m going to go through my daughter’s room and go through my closet again. I’m pretty regular with that anyway because we’ve been nomadic the last five years, so I’m down to like you know, my favorite 40 pieces of clothing. It’s awesome. Rev. Karen MacDuff: [00:48:47] Good for you. Benay: [00:48:48] Oh I take a bag every Week to the Salvation Army you know, and um. So by its time it’s hunting and I can feel I can feel it. And if I’m excited about the Twelve Days of Christmas to be doing that and some of these other practices too. Ok, Karen, we probably should wrap up if there is just one thing that you’d like people to take away from you know, giving their time to listen to this episode today, what would you like that way to be? Rev. Karen MacDuff: [00:49:16] Well I really would invite people to engage in a nightly reflection that takes about 1 or 2 minutes and ask yourself two questions at the end of every night. What brought me life today? And what drained DRAINED my life? What brought me energy? What drained me? And that practice over you know, 12 days and then even to carry it through is very powerful. And to help you decide what direction to go, what to do, what not to do. And it’s rooted in one of the Christian mystics from the 16 hundreds, IGNATIUS. It’s called The Examen. Just a nightly read you know. What brought me life? What drained life? That is very very powerful. It’s called The Examen, Ignatian Examen if anybody wants google it. Benay: [00:50:23] I’ll put the link in the show notes to that too. you know, it just makes me think my. We went out and unvisited Peter Wallman, who is the inventor of passion mapping, I’ve interviewed him a couple of times on the show, and he has a practice where every time you eat a meal together you just say what you are grateful for, for that day. you know, so I brought that back to my family and now every time when we have dinner together we just go around says three of us. And we just say what we’re grateful for and sometimes it’s really silly stuff and sometimes it’s really serious stuff but it’s really nice just to share those. But you know, this one would actually work too. And you know, how cool is it for my 7-year-old daughter to be doing this now already and that which just a nice way to several reflect and that conscious awareness. It compounds. Just like declaring, you do it at long enough and then your awareness. you know, you just start to change your habits. And of course get different results so I love that. I think that’s one of my most favorite so far summary statements for any guest has said. Rev. Karen MacDuff: [00:51:26] Well good I saved the best for last right? Benay: [00:51:28] And I love it. OK. Karen thank you so much for being on the show. If our listeners are loving your messages and how you’re talking about spirituality and want to learn more about you and maybe even get involved in some of these decluttering groups that you’re running how can they get in touch with you? Rev. Karen MacDuff: [00:51:45] Very simple. Just do a Facebook search. Karen MacDuff, the 40-day Mystic. Um, my name is spelled M-A-C-D-U-F-F. Absolutely. And you could see some things that I’m going to be offering and also message me through that. Benay: [00:52:03] Wonderful and what I found with you Karen is you’re very you’re very personable, very engaging, you’re not like the sort of aloof guru on a mountaintop. Like You really love that interaction. Rev. Karen MacDuff: [00:52:14] You know, I’m grounded you know, it an ancient tradition. I just love that that wisdom coming from ancient you know, ancient times. And I can’t thank you enough for giving me the opportunity to talk with you tonight. I really appreciate it. Benay: [00:52:38] Thank you so much for being on the show and doing the seasonal episode with me. It’s been a pleasure. I’m so Excited to get it out there into the world and to share with listeners. Thank you. Rev. Karen MacDuff: [00:52:50] Your welcome. Have a Merry Christmas and a Happy New Year. Benay: [00:52:53] I’m gonna have an awesome twelve days Christmas. I’ve got some great rituals to take on board and see if I can bring my family on board too, it should be really fun. Benay: [00:52:59] Okay listeners. Thank you so much for listening to another episode of Coach Pep Talk. Please be sure to go and like the show on iTunes, it sends us a great karma and we really appreciate your support. Have a great day everyone, And happy coaching. Benay: [00:53:18] Thank you for listening to the show. I’d like to tell you a little bit about my business, Universal Coaching Systems, so that you can connect with us at a deeper level and take your coaching business to the next level in the New Year. It’s our mission at Universal Coaching Systems to contribute to raising the vibrational state of humanity and we do that by being the guardian that helps Coach Change Makers transition into this new business paradigm that the world is moving into with grace and ease. So if you’re interested in that concept and that’s really resonating with you, I encourage you to go visit our Web site universalcoachingsystems.com And sign up for one of our freebies, that’ll get you on our email list and then you’ll get all sorts of wonderful information And of course updates on any new products or courses we’re running. We’re currently full in our Successful Signature Coaching Program Course, but we’ll be running that again in March as well as some wonderful Coach Mastermind Groups and then of course have got our Life Coach Office software and our template packs. So there’s a whole lot of ways we’re helping you rise up and embrace new technologies and the changes that the coaching industry is going through right now. And we encourage you to come and follow us and we will help you get through that transition with ease and grace. I look forward to seeing you over on our site and on our list and communicating with you each week in the New Year. Benay: [00:54:44] If This podcast episode was the first interaction that you’ve had with us welcome, it’s lovely to connect. And for those of you who’ve been following us for a long time thank you so much. You are the whole reason we’re here. And please in the New Year just let us know how we can serve you even more by sharing your ideas through e-mail, on Facebook, leaving comments on our posts. Any way you can reach us, We’d love to hear from you. Happy holidays. Thank you for a wonderful 2017. And here is to an even more awesome 2018 next year. See you then. Happy Coaching.